In the United States, Mendoza is pretty much synonymous with Malbec. This makes sense to a certain extent: Aside from a handful of Bonardas and the occasional other grape variety from this region in the shadow of the Andes Mountains, Malbec comprises most of what we see from here. And it’s not just a matter of export issues: Malbec is king in Mendoza, producing wines that range from gulpable everyday reds to concentrated, complex classics that have the potential to evolve for a decade or more in the bottle. But one of the big advantages of traveling to a wine region is having the opportunity to taste the grape varieties and styles that aren’t being exported in great numbers, if at all, just yet. I arrived in Mendoza two days ago, and have been tasting an average of 45+ wines each day. The Malbecs, perhaps expectedly, have been among the best, and I’ll write more about specific ones when I return next week. But there have also been a lot of unexpected discoveries along the way that have changed what I always assumed about Mendoza: A mature Chardonnay - Pinot Noir sparkler from Familia Zuccardi; a single-vineyard Petit Verdot from Decero; a rich, expressive Syrah from Trivento; a toasty Viognier from Dona Paula and a more French-styled, pear-rich one from Lagarde; excellent Bonardas from Argento and Serrera; a spectacularly subtle Semillon from Mendel--the list goes on and on. The point is this: Keep exploring Malbec from Mendoza and learning about its many styles and expressions, but keep an eye out for other grape varieties, too. Mendoza is a region with all the potential in the world, and in the coming years, you’ll be hearing a lot more about its range of great varieties, styles, and wines. This is, as I suspected, one of the most exciting wine regions (and countries) in the world right now, and all the buzz it’s generating is 100% justified. As an aside, the photo above was taken an hour ago at a truly memorable lunch we enjoyed at Lagarde. 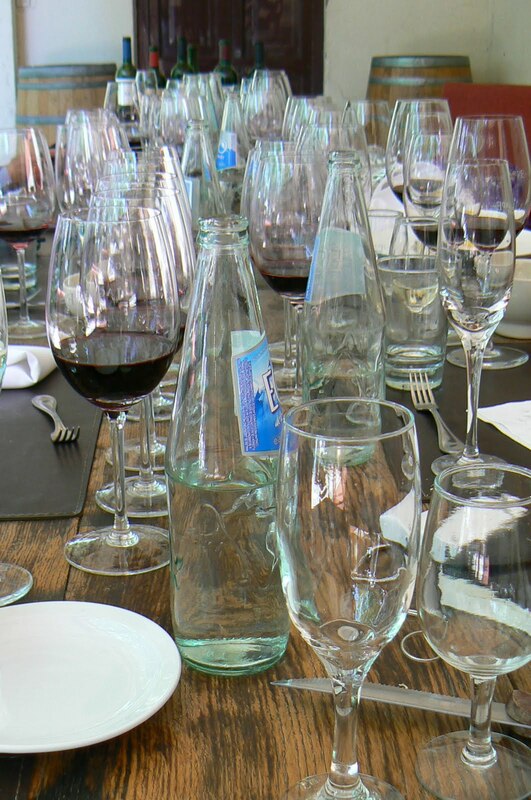 The springtime sun was shining, the food and hospitality were amazing, and the wines, as you can tell from the number of glasses on the table, were flowing freely. What a great place to visit.